An unprecedented call has been made by early education organisations TACTYC and Early Education, supported by other professional bodies, for schools to boycott this new assessment. The tests are not absolutely compulsory, but schools are, in effect, being blackmailed to adopt them: if they don’t, they will not be judged in terms of progress to the end of KS2 but against a very high target of 85% of pupils reaching expected levels. The DfE expects headteachers to choose between the six different versions advertised by its approved suppliers. This new assessment is so bad that, for five of the six versions, the advice is: if you do use these tests, please lock away the data in a cupboard until the end of KS2 because of the damage they will do to your children! 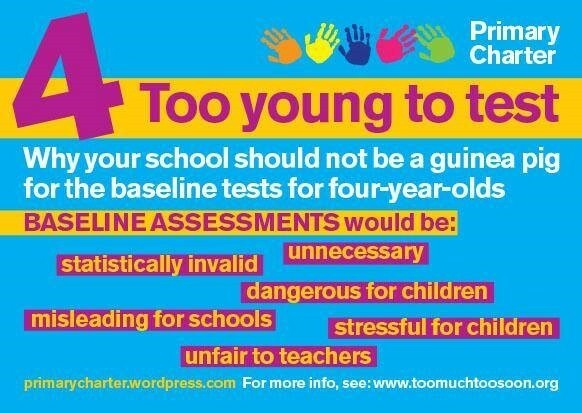 Government makes no pretence that these tests are meant to aid children’s education (though the suppliers’ advertising appeals to this): they are simply to “hold primary schools to account”. There is a strong and growing consensus that these tests are not only educationally invalid and statistically unreliable, but will be harmful to children. This post aims to provide a summary of what the early education organisations are saying, based on substantial scrutiny and research, and to provide wider access to resources. Assessment must first of all be valid. In other words, it should be a genuine indicator and reflection of pupils’ achievement. You cannot assess whether someone can swim by having them write an essay. This baseline assessment is too narrow to be valid. Most of the tests utilise easy-to-administer tasks and questions which reflect language, literacy and numeracy in very superficial ways, providing little indication of what children might achieve. Large-scale summative assessments must also be reliable, i.e. they should provide data consistently. These six very different tests, conducted on 4-5 year olds in their first weeks at school, will not provide reliable information on what children know or can do, let alone a forecast of their potential over the next 7 years. Children new to English, unfamiliar with laptop or tablet computers, or still not settled at their new school, will not score reliably. The different tests will be almost impossible to standardise in order to provide an equitable measure of a child’s progress to age 11, so judgements about a school’s ‘effectiveness’ will be ill-founded. It may also be in a school’s interest to game the system by administering tests in such a way that children score poorly on Baseline, so that its Value Added is boosted. TACTYC and Early Education evaluated the six Dfe-approved versions against common criteria. Only one (by Early Excellence) came close to satisfying Early Years Foundation Stage principles and other criteria. Unfortunately it may take longer to carry out, since it is based on observation of children in class rather than a separate 15-30 minute formal test. All the assessments are limited, moreover, by DfE tendering stipulations: that answers should be straightforward yes/no; conducted in English; be principally about language and communications, literacy and numeracy; completed within the first six weeks of reception; produce a score for each child on a single scale; and scores must not be adjusted for age. Most children taking the tests will be only 4 years old. The DfE’s refusal to take account of their age differences is critical, and in itself invalidates this assessment. Nervousness will inevitably come into play, and many children will misunderstand what is required since the tests are so different from the way 4-year-olds play and learn. 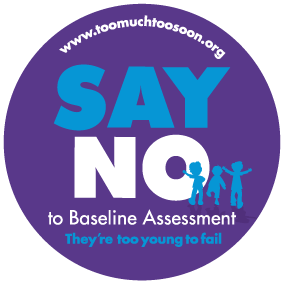 Since Baseline Assessment is supposed to provide a starting point against which to measure future progress and consequently a school’s ‘effectiveness’, it has to be able to differentiate between children in terms of their potential development to age 11. Most of the tests do this very poorly since they consist of easy-to-administer tasks and closed questions which reflect language, literacy and numeracy superficially and provide little indication of what children are capable of achieving. Although some of the suppliers have clearly realised that teachers will expect a broader sense of development and offer a supplementary assessment in social behaviour and attitudes to learning, this appears tokenistic and does not feed into the summative score. The tests may also bring a sense of failure, but ‘they are not failing, they are merely at different stages in their development or are not settled enough’. They will generate misleading SEN diagnoses. If schools try to match teaching to baseline test scores, they will trap many children into pathways of low attainment. Indeed, one supplier’s video features a headteacher who looks forward to sorting children into ‘ability groups’ after just two weeks in school!